G.A.M.E. launches at Ayala Museum, this November 9. The leads, Joseph Reyes, Assistant Vice President, Area Head, Ayala Malls group; Lulu Tan-Gan, Designer; Mariles Gustilo, Senior Director for Arts & Culture, Ayala Foundation. An artist collaboration between Greenbelt, Ayala Museum, and artists and designers (the first of whom will be Lulu Tan Gan), G.A.M.E brings to the forefront the country’s unique history and culture through inspiring artistry and craftsmanship. 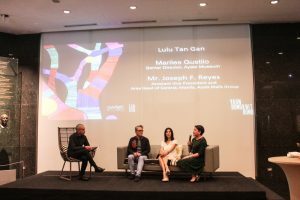 “Through this exciting exhibit, Ayala Museum and Ayala Malls redefine the museum experience, bringing art outside of the gallery and to the outdoors,” explains Mariles Gustilo, Ayala Museum’s Senior Director. 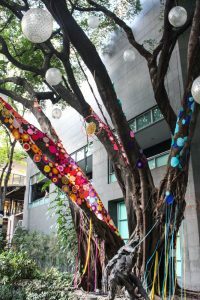 Yarn Bomb Knit Bomb, an experiential art installation, will run until January 14, 2018. This November 8 to January 14, 2018, G.A.M.E. launches its first exhibit in collaboration with designer Lulu Tan Gan. 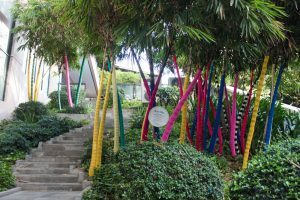 The special art installation, called Yarn Bomb Knit Bomb, delights passersby with its bright, bold colors and retro patterns, which decorate the trees and gardens. This is done through amazing traditional ways of constructing fabrics; knit, crochet and weave works, aptly bringing to light the Philippines’ long weaving traditions and culture. There are different Yarn Bomb Knit Bomb stations around the Greenbelt area. Pictured above is the “Retro Steps” station. 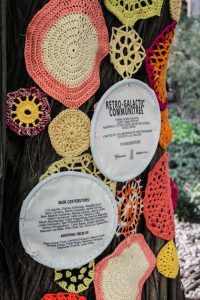 The centerpiece of the exhibit is the Communitree, a crowdsourced installation of knitted doilies. A closer look at the Retro-Galactic Communitree. 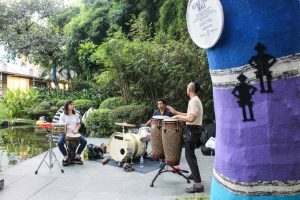 The Hernandez Brothers treats the audience to a folk-inspired music performance at the Retro Tribo Walk station. 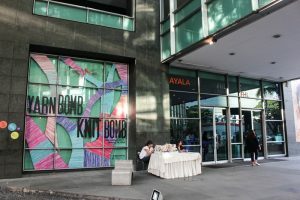 This massive exhibit is supported by Kinka Graphics, Rupert Signs, Manila Bay Thread Corporation, DLSU-CSB students, Crowd Source Participants, and Astoria Hotel. One of the knitwear artists, Erlinda, demonstrates her craft. This season, discover new ways to appreciate local art and artistry, and be wowed by new experiences.